I remember standing with my father as the driveway salesman told us it would be completely fine to pave over the tree’s root flare. He promised us that it wouldn’t hurt the tree or the driveway. 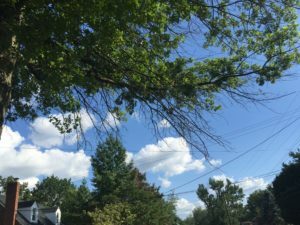 It didn’t take long before we realized the driveway part of that statement was a lie, but it took years before we learned that this decision would cause irreversible damage to our Oak tree. In the end, my new driveway destroyed my tree. 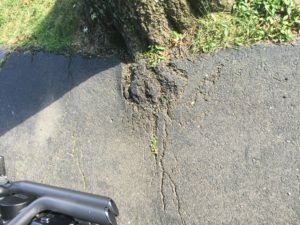 At first, the tree roots started to crack the driveway, which frustrated my parents. Little did we know it was the tree’s attempt at self-defense. Eventually, the tree stopped cracking the driveway any further and everything seemed great. It wasn’t until a few years later that we started to notice small branches falling out of the tree. My mother blamed it on squirrels. But come every Autumn the tree still had enough leaves to cover our yard time and time again, in our minds nothing was wrong. Come springtime our Oak started dripping what we thought was sap. Annoyed by sap all over our cars every morning my dad threatened to cut down the tree. But my mom protested and eventually won, in her eyes the sap was normal and the tree was healthy so why cut it down? In reality, our tree was infested with secondary invaders. Secondary invaders are pests that only infect trees after they are in a weakened state. In our case, it was a plant-sucking insect whose excrement resembles sap. It wasn’t until the next spring when the tree’s leaves grew in patchy that my parents began to think something was wrong. Now my once great Oak, the tree that provided me so many memories of childhood games and adventures, is barely hanging on. It has huge patches of deadwood and low hanging branches which clip the communication and power lines when they fall. For safety reasons, it will be soon taken down. As I look back now, with the knowledge working at RTEC has given me, I realize our tree has been struggling for a long time. For years it has been trying to heal itself from the damage we imposed on it; all while trying to provide a full, beautiful canopy with only 60-70% of its roots fully functioning. The thing is, trees die slowly. Just as it takes years for them to grow tall and strong, it takes years for them to start showing their decline from root damage. 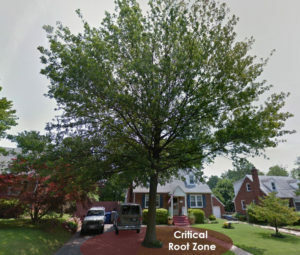 I’m sharing my story because most homeowners don’t know that construction damage can do irreversible harm to a tree and most only notice the signs after it’s too late. So You’re Saying I Can Never Do Any Construction Without Killing My Tree? No, thankfully trees are resilient. Trees can survive your construction project if they are properly prepared for construction and cared for after the event. This kind of before and after care is what we call a Tree Preservation Plan. If you are having construction done on your property and don’t want to do irreversible damage to your trees a Tree Preservation Plan is imperative.